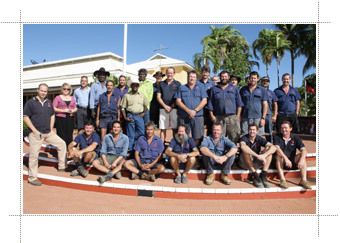 Kimberley Regional Service Providers (KRSP) provides a range of quality services including maintenance, repair and capital works that improve the quality of life for Indigenous people living in the Kimberley Region of Western Australia. Since our inception in July 1998 we have successfully provided services to 54 remote communities throughout the Kimberley as part of our Remote Area Essential Service Program (RAESP) contract. We have gained a reputation for technical innovation, reliability, quality of workmanship and professional services. Part Aboriginal owned KRSP is a joint venture between GJ Johnson & Company and the Marra Worra Worra Aboriginal Corporation. Our Managing Director is Gary Johnson and we have the resources and infrastructure to provide state of the art services and a commitment to promoting opportunities for Aboriginal participation at all levels in our business whilst incorporating the Aboriginal heritage of the Kimberley.